Posted on 3, August 2016 by EuropaWire PR Editors | This entry was posted in Defence, Government, Security & Safety, United Kingdom and tagged BAE Systems, Joe Senftle, Maritime Indirect Fires System, MIFS, Type 26 Global Combat Ship, UK Ministry of Defence (MOD) Awards. Bookmark the permalink. LONDON, 03-Aug-2016 — /EuropaWire/ — BAE Systems has received a $245 million contract from the UK Ministry of Defence (MOD) to provide the gun system, known as the Maritime Indirect Fires System (MIFS), for the Type 26 Global Combat Ship. This award follows the MOD’s announcement of BAE Systems as the preferred bidder last year after a competitive process. Under the contract, the Company will manufacture three MIFS Integrated Gunnery Systems (IGS) and one trainer system for the UK Royal Navy. The MIFS IGS includes the 5-inch, 62-caliber Mk 45 Mod 4 Naval Gun System, along with an automated ammunition handling system, gun fire control system, and qualified ammunition. The contract includes an option for five additional systems for the remainder of the UK Royal Navy’s Type 26 fleet. Joe Senftle, Vice President and General Manager of Weapon Systems at BAE Systems, said: “Our teams in the US and UK will bring unrivalled skills and expertise to the MIFS development and production. The world-leading Mk 45 will provide the Royal Navy with a proven, reliable, and highly-effective system that is adaptable to firing a wide range of today’s ammunition, as well as future, precision-guided munitions currently in development. The Mk 45 is in service with the US Navy and 10 other allied nations. 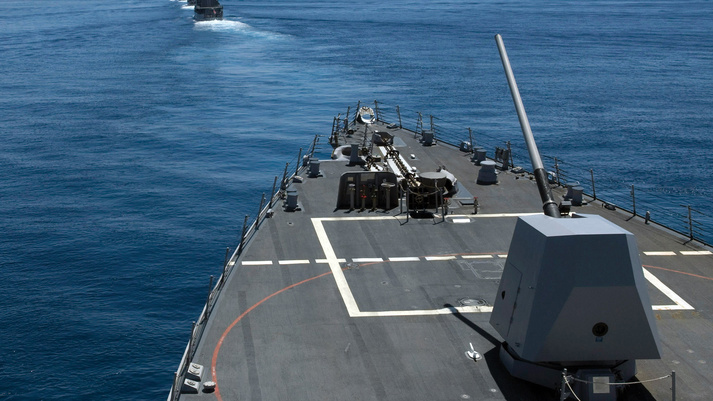 More than 240 Mk 45 guns have been delivered into service globally. Work on the contract for the UK Type 26 ships will be performed at BAE Systems’ facilities at Louisville, Kentucky, and Minneapolis, Minnesota, in the US and at Barrow-in-Furness, Frimley, and Glascoed in the UK, with deliveries expected from 2020. The UK Government committed to buy eight of the advanced Type 26 Global Combat Ships in its 2015 Strategic Defence and Security Review, which will in time replace the anti-submarine warfare Type 23 frigates. Type 26 will be globally deployable and capable of undertaking a wide range of roles from high intensity warfare to humanitarian assistance, either operating independently or as part of a task group. The ship has been designed with an acoustically quiet hull and there is flexibility in the design to allow Type 26 to be upgraded as new technology develops to ensure that it remains relevant to future requirements.